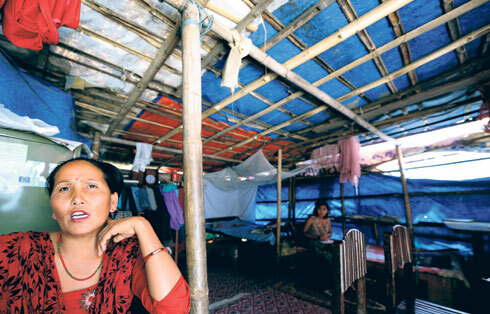 Forty-year-old Hari Kumari Jimba from Sindhuli lives in a tent-like house made of bamboo and plastic on the bank of Bagmati. She sometimes slides the plastic at one end and makes a “window” so that fresh air and sunlight can get in. Her “home” is partitioned with thin slabs into a kitchenette and a bedroom. A few broken utensils, a moldy cupboard, some worn-out chairs and an old bed in a corner are all that it contains. “I fear that my children will lose this shelter. Any day, the government authorities may tell us to leave, or worse, the river Bagmati may flood into the tent,” she says. Jimba is one of the 4,000,000 squatters in Nepal. She has been living in the Thapathali slum for the past twelve years. This area of 60 hectares contains 258 shelters. It is one of the 68 slum settlements on the banks of the rivers Bagmati and Bishnumati in Kathmandu. According to a recent survey conducted by Nepal Basobas Basti Samrakshan Samaj, an umbrella organization of landless people, in Kathmandu alone, there are 3,240 squatters who are above 16 years of age. Each of them has his own stories which have brought them to Kathmandu, this city of opportunities and challenges. According to Lajana Manandhar, Director of Lumanti, an organization that has been working with squatters for the past twenty years, there are various reasons why somebody turns into a squatter. In addition to those who have flooded into the bigger cities due to the decade-long Maoist insurgency, or for the purpose of education and employment, slums have also become homes to those newly liberated bonded laborers (Kamaiyas) who have no land, no skills and no resources to support themselves. With the passing of years, squatter slums, just like any neighborhood or colony in the city, have turned into little worlds of their own. People from different parts of the country live in these areas like one huge family. Community meetings are held when a problem needs to be solved, delegations are formed when certain demands have to be made to the government, and preschools are set up for those children whose parents cannot afford to send them to daycares. And in addition to such efforts from within the communities, sometimes, external resource persons are appointed by different organizations working for the benefits of squatters. Sarita Ghimire, 25, has been teaching small children at the Thapathali slum for the past one year. She was brought here by Expansion Nepal, one of the many organizations that have been working with squatters. She teaches the children for six hours from Sunday to Friday every week. “It’s certainly more challenging to teach these kids since they are used to a more open environment. In the beginning, it took me almost a week to make them sit on the chairs and benches,” she shares. These nongovernmental organizations have also been helping to make lives better for slum dwellers by providing vocational trainings to women in order to develop livelihood skills and setting up cooperatives to issue starting capital for small businesses at minimal or zero interest. The women’s committees formed under their supervision help the slum women to deal with domestic violence and human trafficking. “We, the women of slums, are vulnerable due to our social and economic status. Recently, we rescued a teenage girl who was working as a housemaid after she told us that she was at the risk of being sexually exploited by her employer,” informs Jimba who has been a member of the committee ever since its formation. However, regardless of such efforts, a slum can never be an ideal residence for anybody in any corner of the world. Particularly in Kathmandu, where most slums are located on the roadside or the banks of highly polluted rivers, there is always the problem of sanitation and the fear of floods. There is also a lack of security, given that the land belongs to the government and the slum dwellers may have to evacuate at any time if the space is needed for road expansion or other similar developmental projects. One of the first settlers of the same slum, Dalmardan Kami, 39, has been living there for eight years. Originally from Tehrathum, this father of two does some painting and labor works to support his family. He is one of those squatters who lost their homes and possessions when the government trampled the houses in Thapathali slum two years ago. “It was a very unfortunate incident. I not just lost my house and belongings that day but my wife lost her unborn child in the mayhem,” he says, adding that many squatters go through intense psychological trauma along with immense financial crisis as an aftermath of such evacuation procedures without a substitute settlement. The slum at Balkhu is a six-year-old settlement that has 370 houses and around 2,500 settlers. Like every other slum, this place too is struggling with the basic infrastructures like electricity, education, drinking water, and sanitation. A slum where most of the dwellers are rickshaw pullers, carpenters and laborers, domestic violence and economic crises are other harsh reality. Rabina Tandukar, 29, who is from Ramechhap, describes life in a slum as one full of struggles, particularly for a woman. There is no respite from intense physical labor and household chores on a daily basis. And things are made worse when the husbands drink and forcibly take away their wives’ hard-earned money to buy more alcohol. Lack of education opportunities and exposure to a more civilized world are the main reasons behind such circumstances. Most people here live an insulated life, and many people have lost trace of their ancestral lines and self identities. Talks and discussions have been made time and again regarding the issue, but a concrete solution is yet to be achieved. The efforts to rehabilitate squatters made by the government and organizations like Lumanti have not been very effective so far. While the government plans to eventually resettle them, based on its convenience and choice, the squatters are unwilling to be shifted to a place which is far from the city centers where they can get petty jobs and save transportation costs. According to Laddu Khadka, Vice President of Nepal Basobas Basti Samrakshan Samaj, a secure shelter is the right of every citizen. And even if there has to be an evacuation for developmental purposes, he insists, it should only be carried out after arranging an alternative settlement, and definitely not while allocating meager compensation. “It’s the government’s responsibility to pinpoint those squatters who are genuinely homeless, landless, poor and in difficulty. It has to provide them with adequate aid and support,” he says, clarifying that they have formulated a committee that will be voicing the squatters’ concerns at the current Constituent Assembly. The fear of having to pack and leave one day is like a patch of dark cloud looming over the horizon all the time. And yet, most don’t have any option but to spend their nights fearing the floods and pass their days in frustration and desperation. The squatters’ issue has been a national problem for many years now, and the road to solving it has met a dead end several times. There is a new Constitution being drafted, and the time has come to formulate concrete policies and strategies that will rest the matter, once and for all. Is there an end to the squatters’ turmoil? Particularly in the Third World countries like Nepal, where development is limited to certain major metropolises or city centers, it is not unnatural for the people from the periphery to flood in, in search of better future and bigger opportunities. However, this kind of migration results in grave problems related to social security, water, health and sanitation, land distribution system and division of basic developmental infrastructures in the receptor area. The solution to the mayhem thus created, although available, can be quite tricky to implement. Squatters, also known as sukumabasi in Nepali, belong to this deprived category that throngs from the fringe to the nucleus with hopes, dreams and expectations of a more comfortable life. These people who live on the banks of Bagmati and Bishnumati right at the heart of Kathmandu have the lowest of incomes, hardly any education and a lost sense of identities, roots and origins. Squatters like Hari Kumari Jimba want alternative settlements where their economic, social and psychological requirements are met. Relocation, however, is not that easy. Although some slums are comparatively newer, there are people who have lived in such areas for three or four decades. They have a community, a life, a world of their own and it is quite difficult for them to adapt to a sudden drastic change. Sunil Karna, Deputy Director General of Housing Division at Department of Urban Development and Building Construction, emphasizes that rehabilitation and relocation is a sensitive matter that requires a lot of prior planning, analysis and practical understanding on the government’s part. Basic human psychological needs of companionship as well as the rights to development infrastructures should be kept in mind before any step is taken in this direction, he explains. “Providing shelters to people isn’t sufficient. Relocation loses its significance if the new site is unable to fulfill the emotional, economic and social needs of the settlers,” says Karna. Shifting one’s home, no matter how temporary, to a different location comes with a lot of psychological and physical baggage. And given the fact that most squatters are laborers, vendors and porters who depend on their daily wages for sustenance and livelihood, they always find city hubs and those areas under construction more preferable in terms of income generation. However, there have been some attempts, albeit feeble, to find suitable homes for these homeless people. Even at present, a complex is being constructed at Ichangu in order to rehabilitate squatters. And almost a decade ago, one such complex had been built at Kirtipur with a joint effort of the government and an organization named Lumanti, which has been working in the sector of squatters for two decades. “Those who chose to be rehabilitated in the complex had to pay back a certain sum of money to the government within 15 years. This may not have been the ideal alternative, given the location’s distance from the city center, but it was something to start with,” says Renu Lama, Management Information System (MIS) Officer at Urban Resource Center in Lumanti. The solution to the problem itself too should not remain that complicated either.